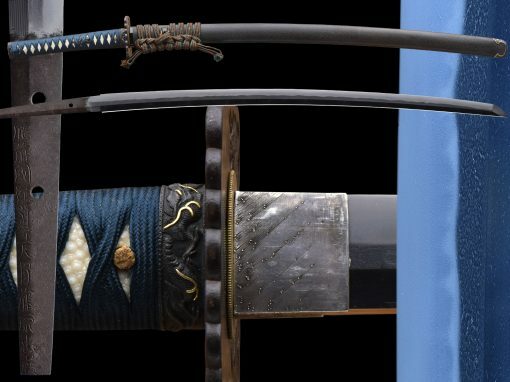 This is a shin shinto tanto in mounts. 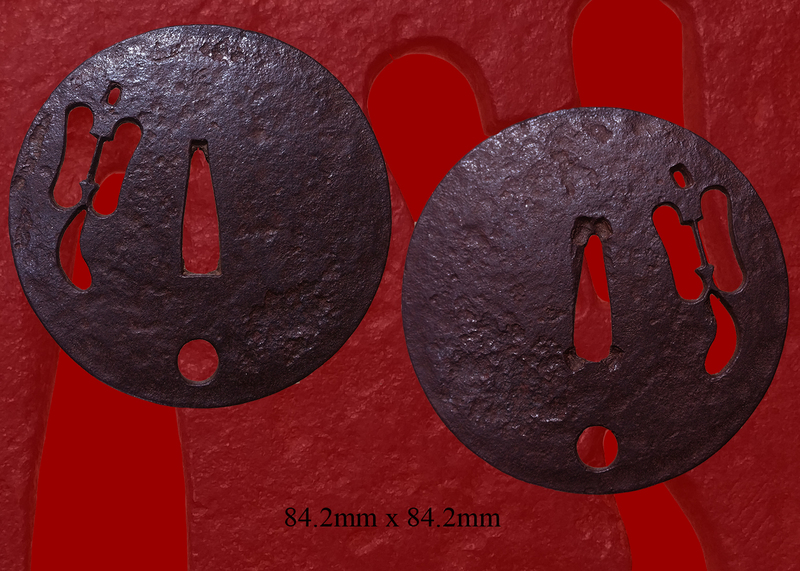 The overall condition is very good. 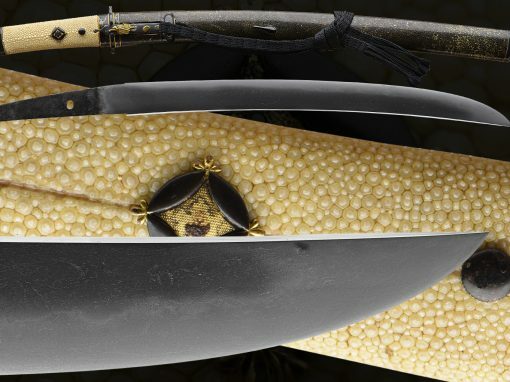 This blade is more than likely from the 1800’s and the work on it is clearly visible. 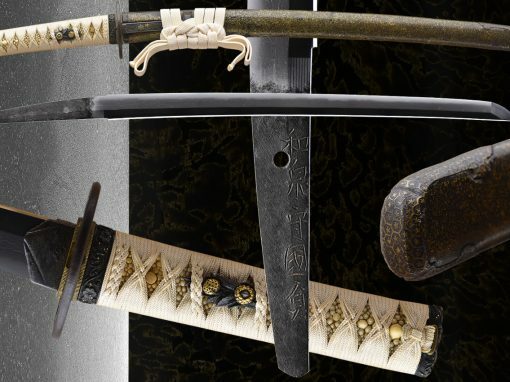 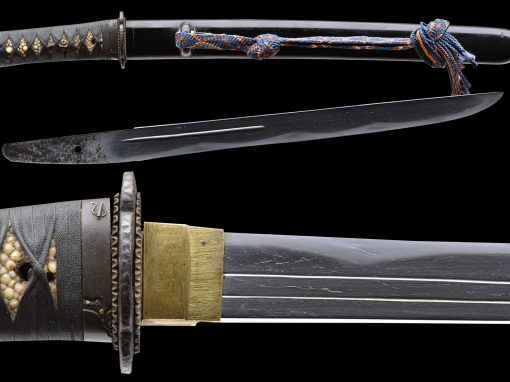 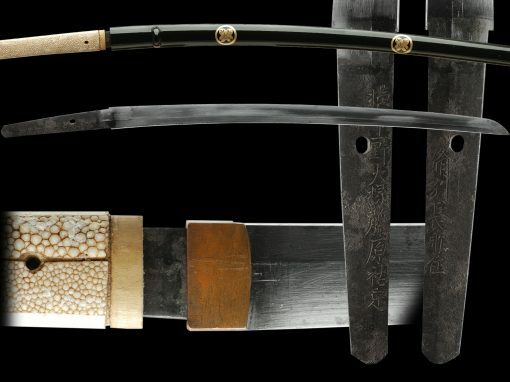 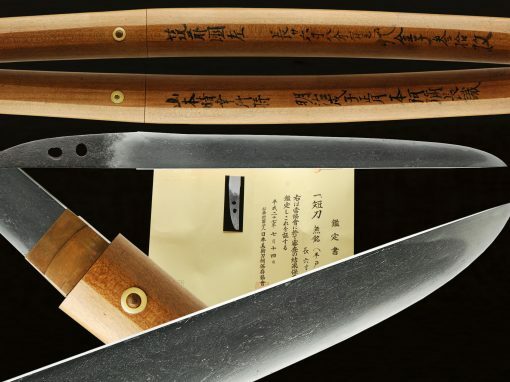 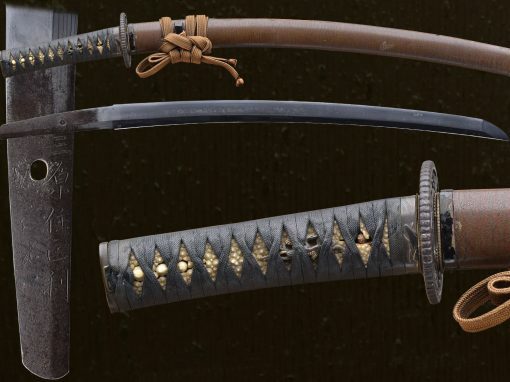 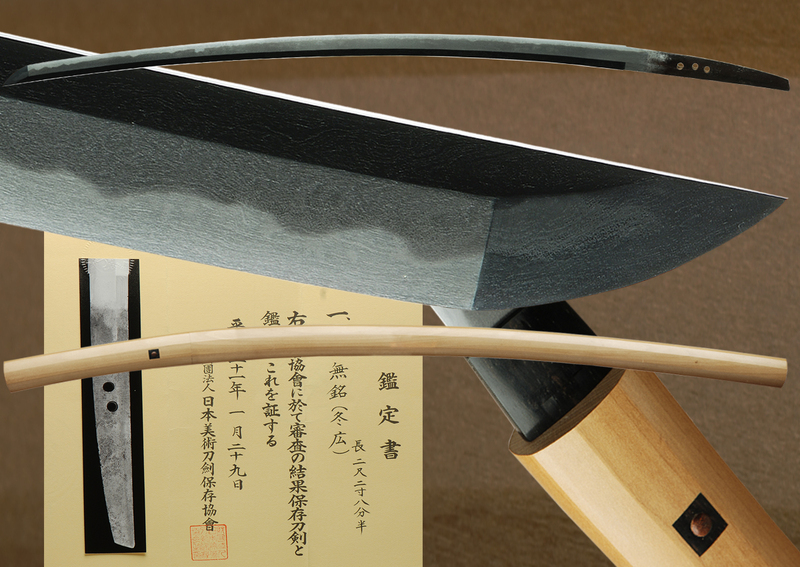 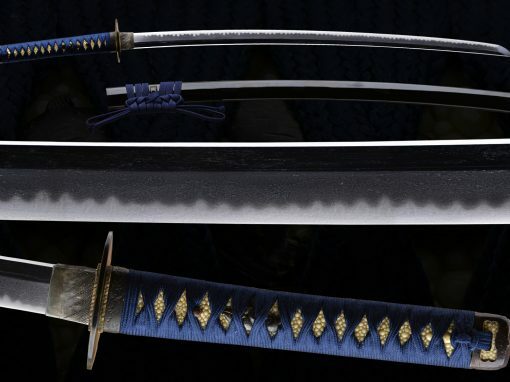 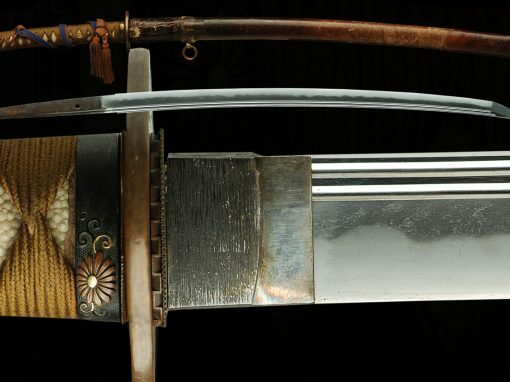 The hamon is in gunome style and looks attractive. 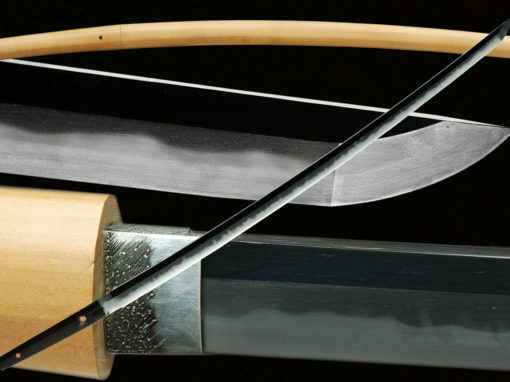 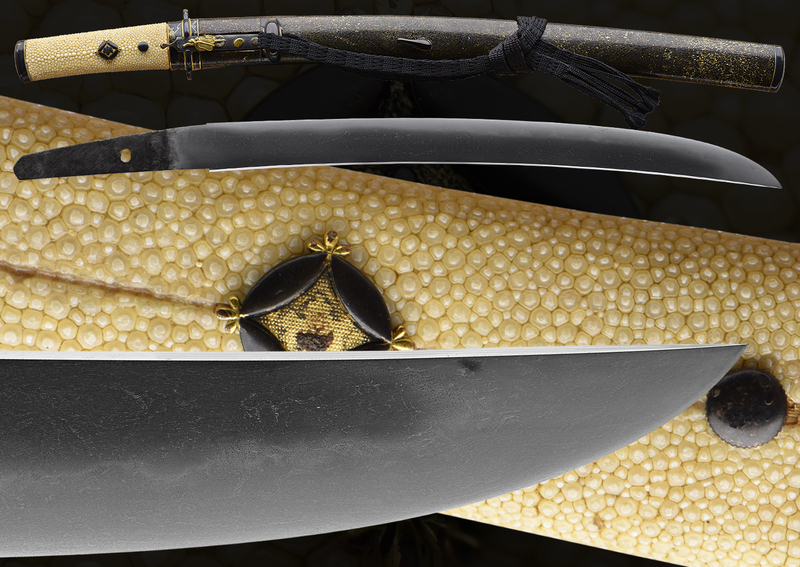 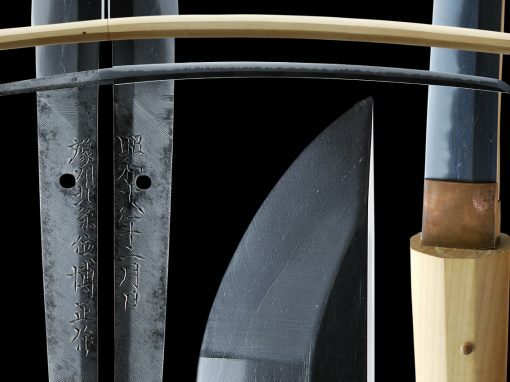 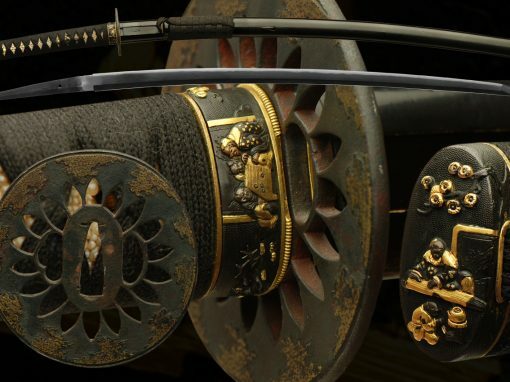 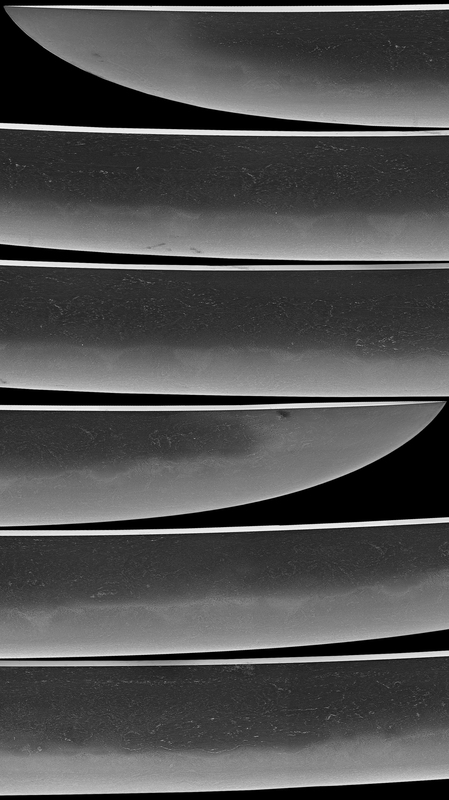 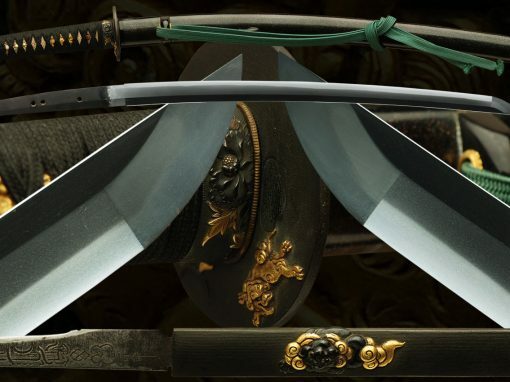 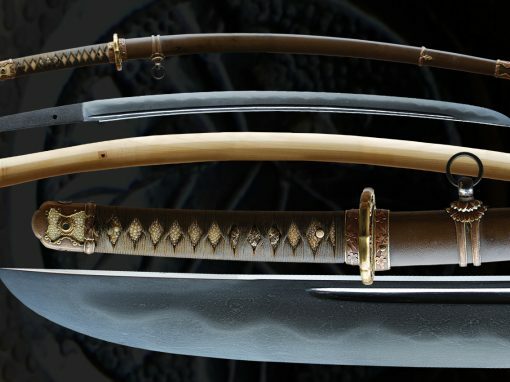 There are many little inner workings (hataraki) that can be seen peppering the blade. 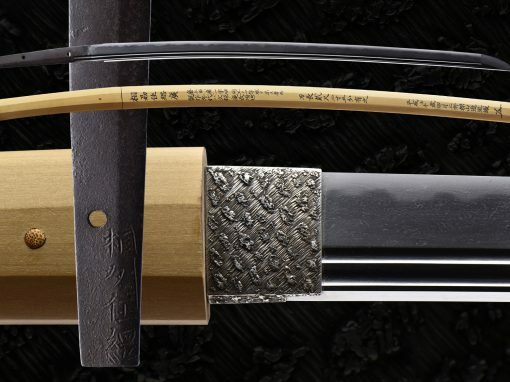 A layer of ji-nie can be seen frosting the hamon. 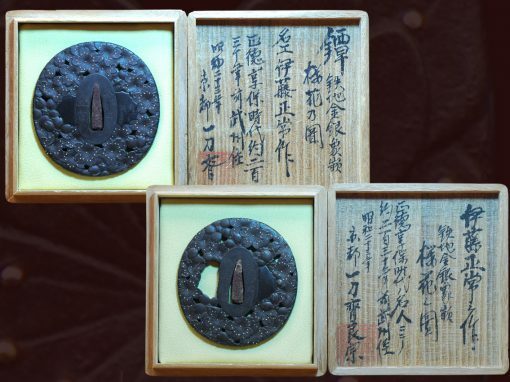 The hada is itame and clear and fine chikei and ji-nie can be found. 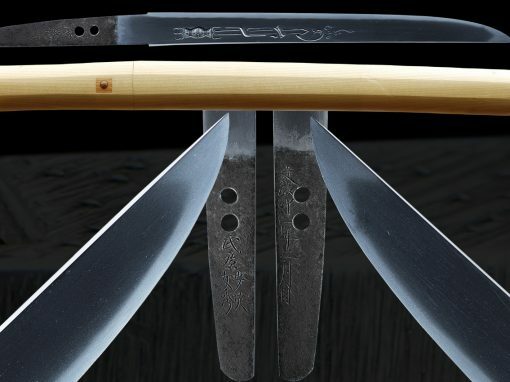 This tanto was well made and the mounts are a mixture of shakudo, gold and copper with a Togidashi Makie style lacquer on the saya. 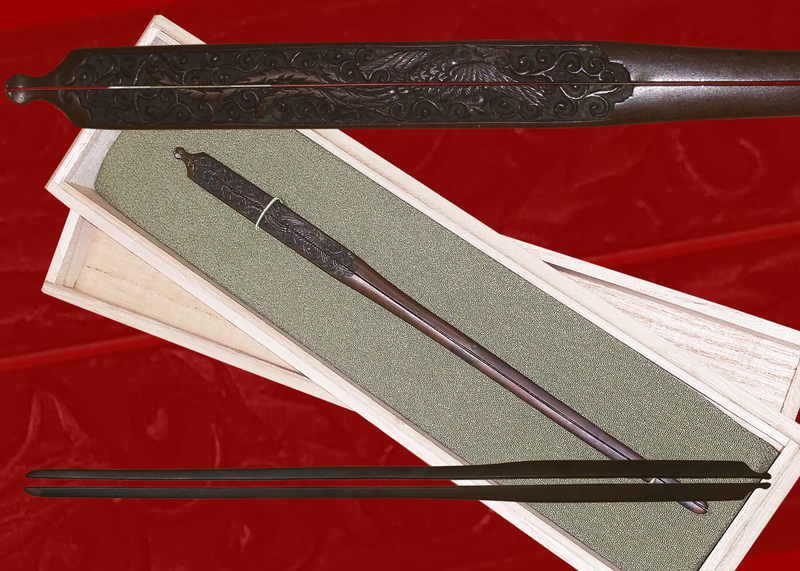 Overall a very reasonably priced tanto for a new collector that is in very good condition. 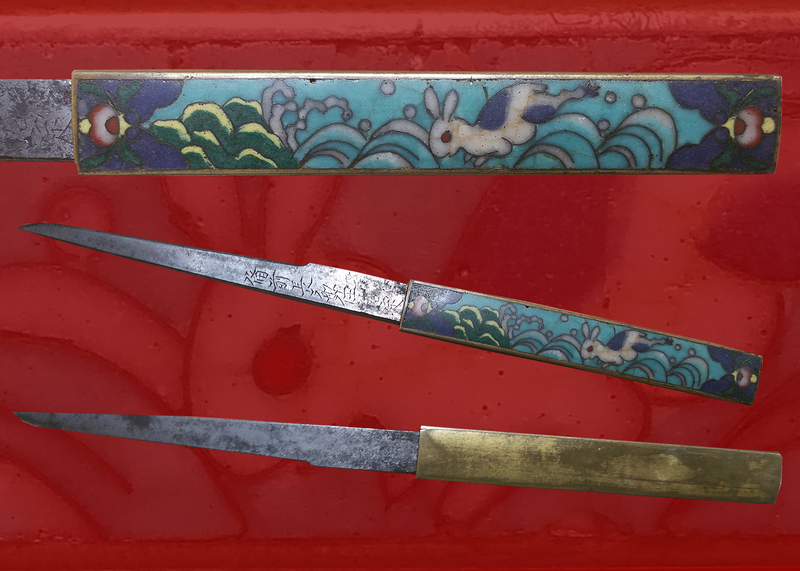 The older polish is very clean and in very good condition some minor openings are visible but can polish out and not deep. 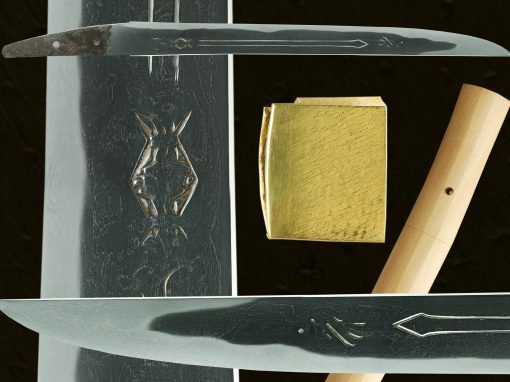 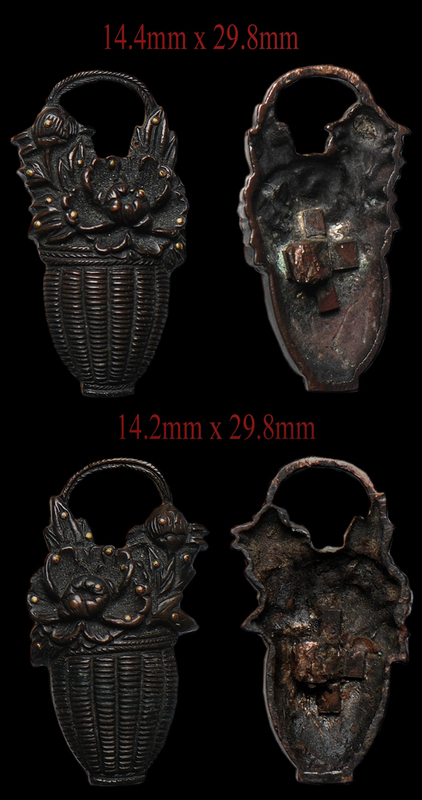 The fittings are matching (fuchi/kashira/tsuba) in a Buddhist design, There are kodzuka and kogai of shakudo with gold of various design, and the the sageo is a very nice braided black The saya is finished in the swirling Togidashi Makie style . 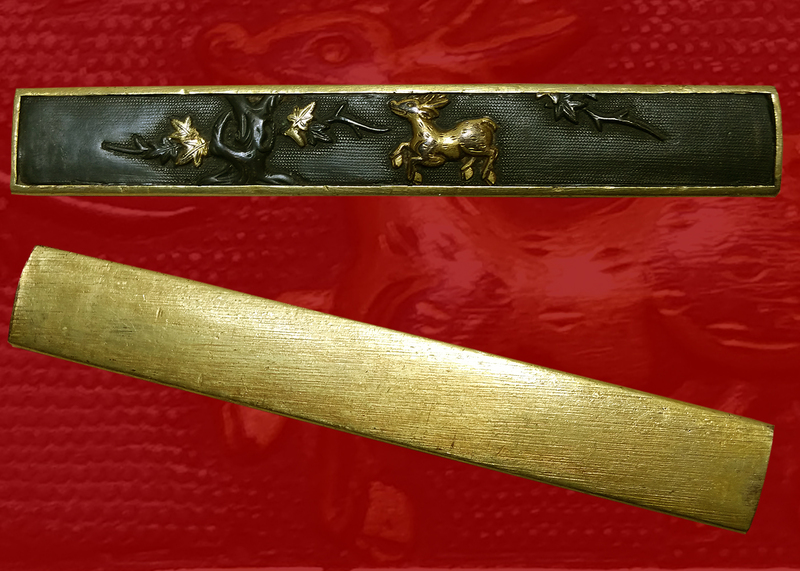 The habaki is 2-pieced of a gold washed copper. 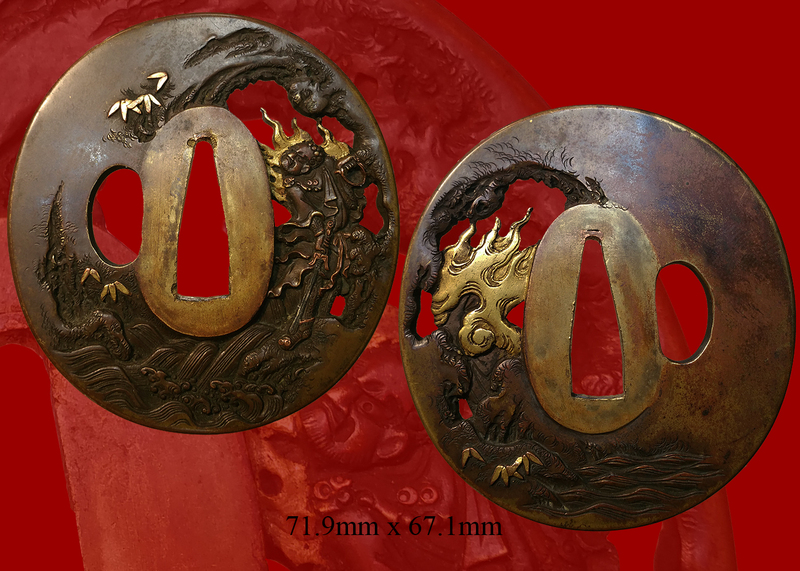 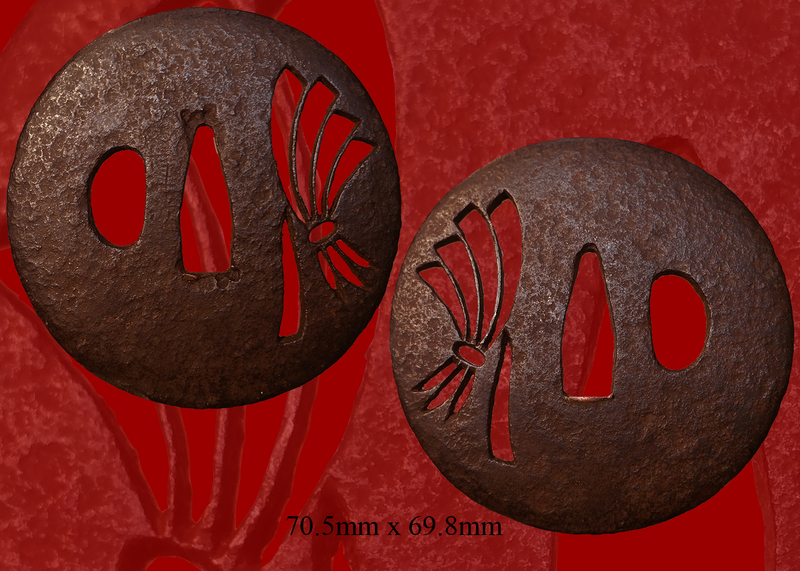 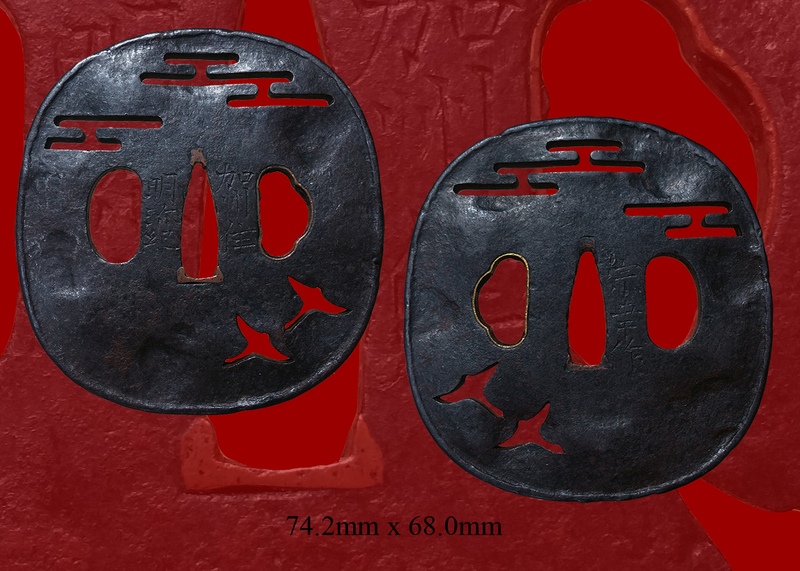 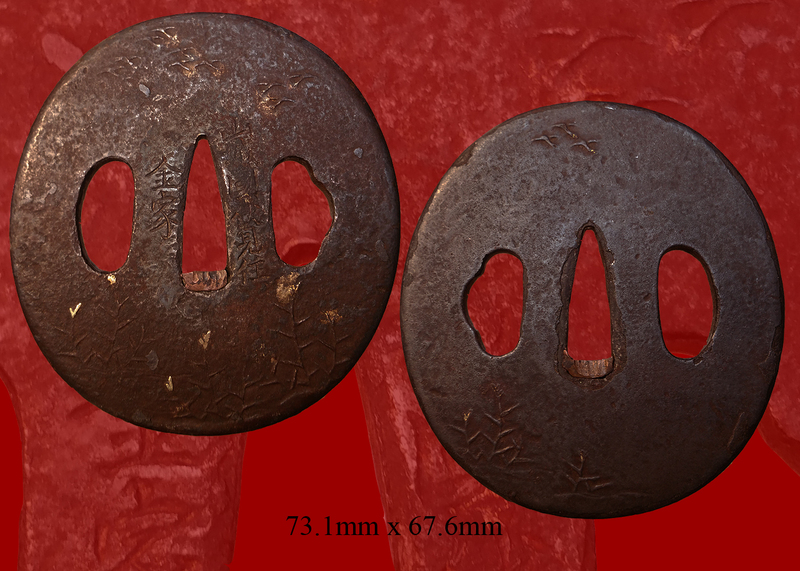 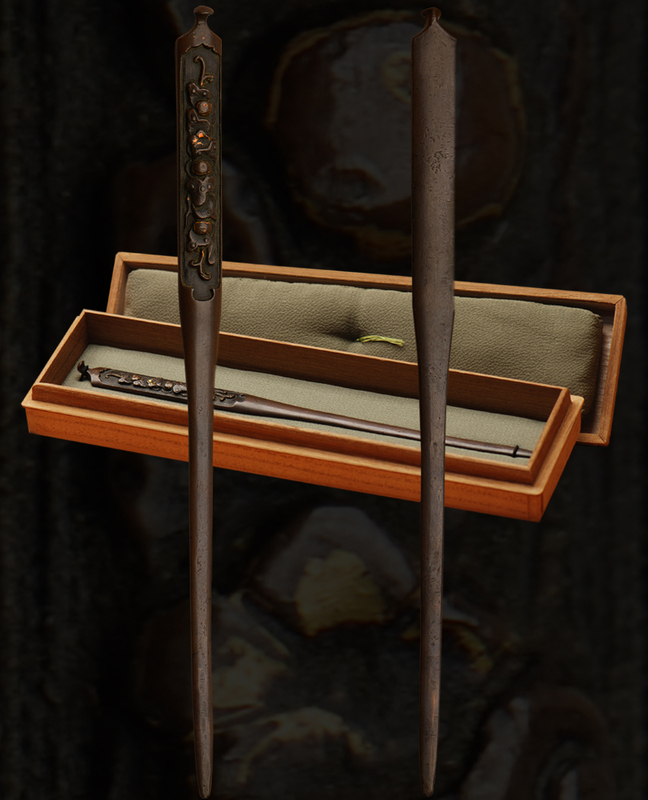 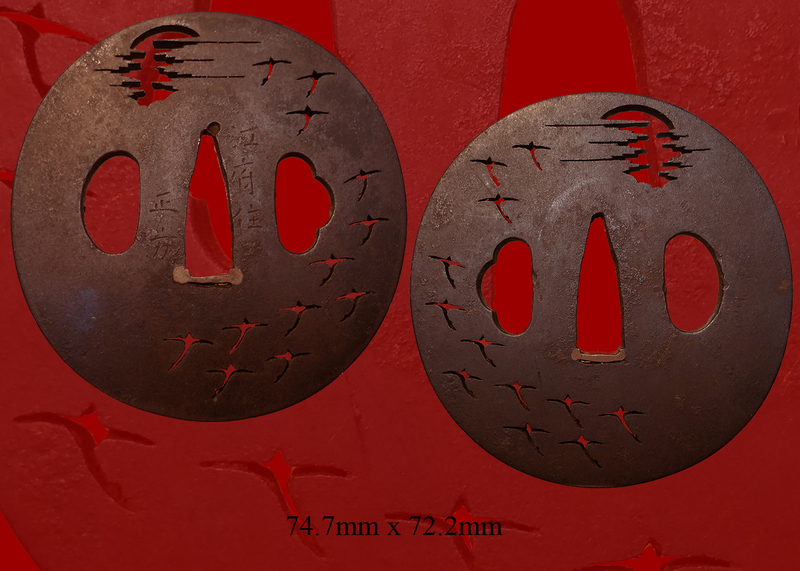 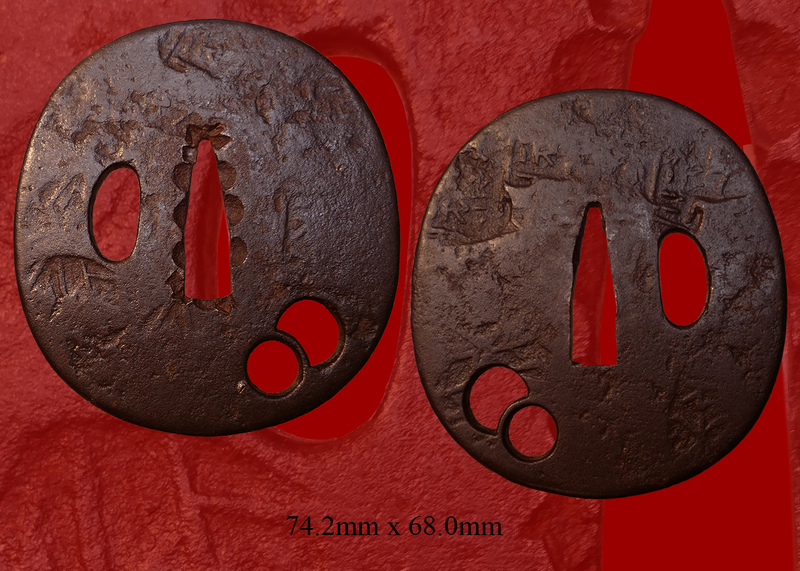 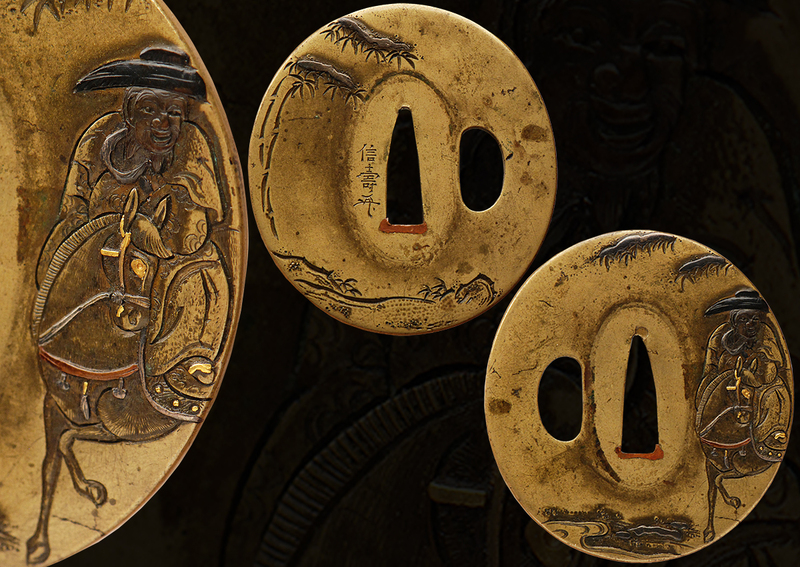 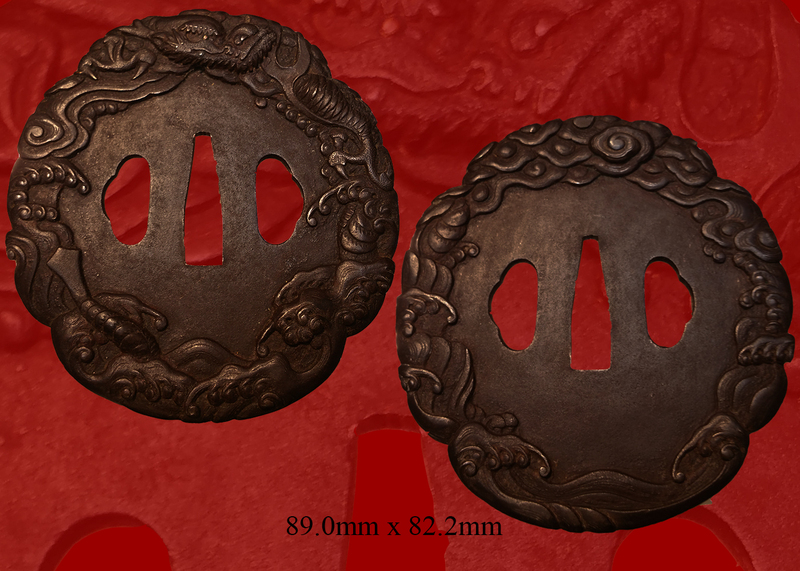 The handle is done in Same (rayskin) with Mon menuki. 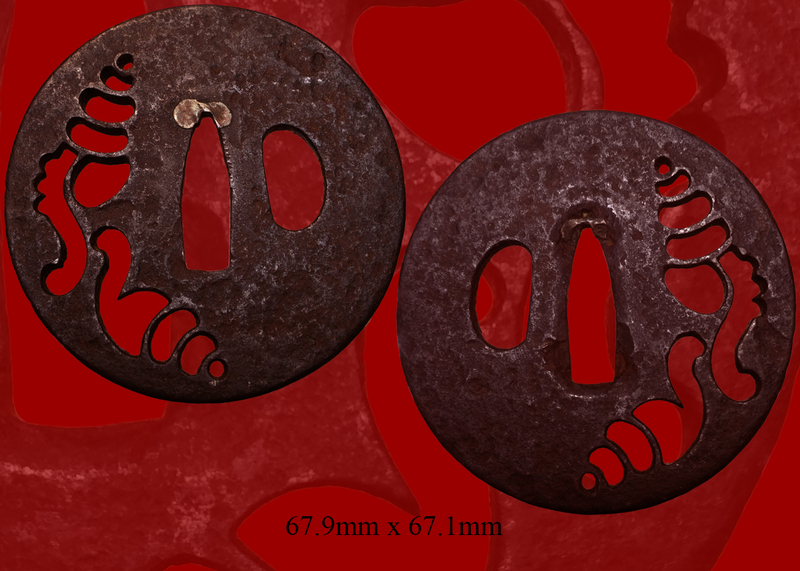 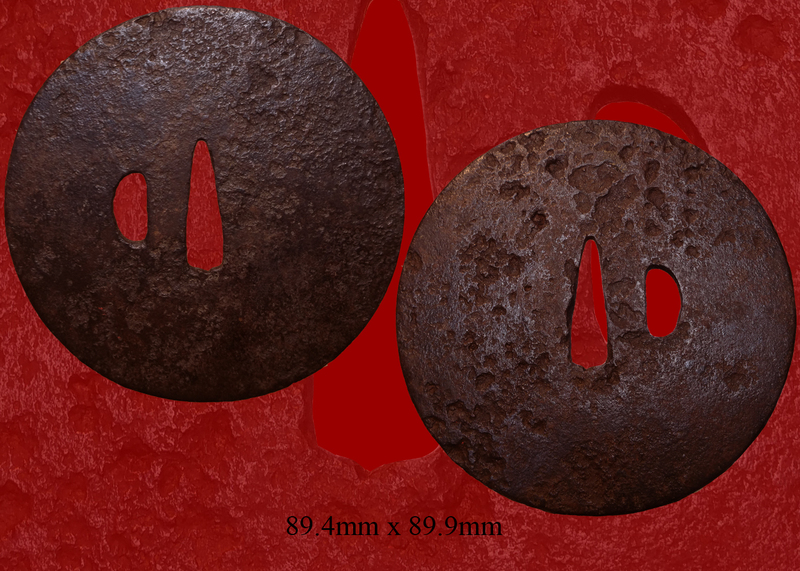 Email us if your interested in this item and remember to include the order number for this item: fss-817.